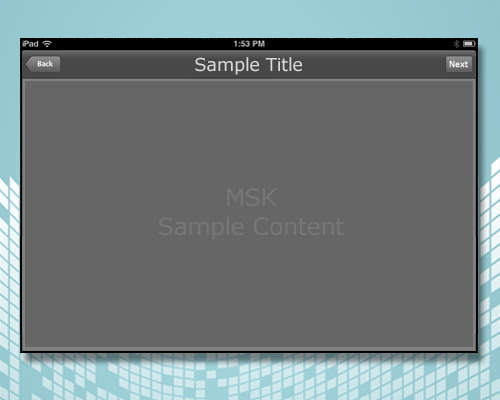 MSK (Cross-Platform Mobile Starter Kit) provides an excellent starting point for your next mobile project. Built with the same proven Flash-To-Mobile solution that powers the hottest apps in iTunes and Android marketplaces. Publishing for mobile is challenging, and publishing for multiple devices (phone vs tablet) and multiple platforms (iOS vs Android) is a challenge. Add quality and depth to your project and save time and costly mistakes. Main SampleView - This blank canvas is where your content goes. Add as many views (pages) as you like. Web SampleView - Show your favorite web-page within the app. Uses full native web-kit. External Assets - Create your art in Photoshop and/or Flash. Yes, scalable graphics work great! Robotlegs Framework - Uses the free, powerful, proven app framework (Robotlegs.org). Yes, we have it! HD screencast tutorial video is included to help train-up newbies. ANE Compatible - Use your favorite Adobe Native Extensions (such as Facebook login). Want more features and development services - Contact us! The template app targets the Apple iStore for iPad Touch / iPhone 3GS / iPhone 4 / iPad (1, 2, 3) and the Android Marketplace for myriad Android phones and tablets. The app's liquid layout looks great on any device at any orientation. RMC consults to understands your needs, updates the app/files/folders/classes, migrates the project to your SVN/GIT, and provides HD Video training to get you started.